Whew! Just finished four days of Con and personally speaking, I am exhausted, but not burned out. I wanted get this thread up for Dave Thaler and I to share our experience and post vids, but also to make sure that people who attended might have a place to share theirs as well. 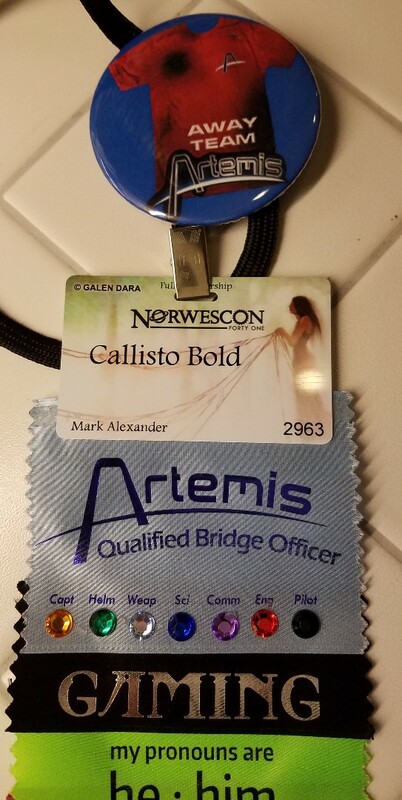 Last yer we had badge ribbons that were silver foil on navy blue featuring the Artemis logo. We learned that they had become fairly coveted among ribbon traders. (Who knew ribbon trading was a thing at Con?) I had already considered doing something to let players indicate what stations they had played, but with this info I decided to up our ribbon game. You'll also note that we had an Away Team pin that was used for Dave Thaler's latest scripted mission. I'll give him a chance to discuss that. More to come as I get them uploaded. Something that I wanted to share with Thom and all of you: We all know that the different stations/roles appeal to different people. Sometimes it's based on gaming experience, sometimes it's based on comfort in a certain role (e.g. Captain). Although I like to encourage players to try each role to at least be familiar with what everyone else contributes, I also appreciate that people can find a role that fits them well. This was brought home for me when a player described themselves as being on the autism spectrum and that they did try each of the stations, but were most comfortable at engineering where they could focus on maximizing efficiency in their own slightly OCD way and not have to deal with some of the distractions that other player need to focus on. That really made me reflect on how each of the stations really emphasized a different skill set and make different roles more (or less) accessible to different personalities. Some of that occurs in other multiplayer games that have different roles/classes, but those tend to share the same sort of interface whereas the controls/stations for Artemis are all quite different. As I looked around, it was interesting to note how some people were overwhelmed by all of the buttons on the HOTAS helm joystick and others took to it easily. Likewise for comms where some players could separate the wheat from the chaff and others communicated nothing or absolutely everything. Again, some of it was about experience and familiarity, but a lot of what makes Artemis work is that it is accessible to a variety of players in a way other games aren't. Since Armada is fast approaching, I want to mention that 2.7.1 was quite stable. We ran for 8-10 hours/day for 3 days and had maybe 3 server crashes (one was a scripted mission). Restarting the server machine periodically seemed to help prevent problems. Didn't notice any other problems. Play was at difficulty 5 or lower. Two full bridges plus up to six fighters. Those videos are great! Thanks for sharing them. Although I like to encourage players to try each role to at least be familiar with what everyone else contributes, I also appreciate that people can find a role that fits them well. This was brought home for me when a player described themselves as being on the autism spectrum and that they did try each of the stations, but were most comfortable at engineering where they could focus on maximizing efficiency in their own slightly OCD way and not have to deal with some of the distractions that other player need to focus on. In my experience, Engineering is the least "Artemis-like" role on the ship. The Engineer can do a good job just by paying attention to the context and putting power/coolant/repairs where it is needed without being told to do so. Also the Engineer can do a good job and never speak a word. While it is possible for the Engineer to be a very social and vocal role player that is never essential for the game. Of course it is also possible for an Engineer that is too withdrawn to doom the entire crew by cutting power to a vital system at just the wrong time. Newbie Engineers do this a lot. Agreed Mike re: engineer. But I would add that it's fairly realistic in a sense. Having worked in naval propulsion plants and building facilities, I can say from experience that when you excel at your job, no one says anything, because from their perspective everything works like it should (it may even be working better than it should, but they can't tell). But when there's a problem is when you get the attention. When I'm captain, I always try to show my engineers some love - usually by getting coolant or other engie perks. There is a saying on my ship: The best engineer is the one that you dont know is there. So if you get done with a mission and you never had to ask the engineer for anything, he did a damn fine job. We ran for three days, roughly noon to midnight, with some breaks. We had space for 17 players (2 bridges plus 5 fighters), and were full for most of the time, almost always between 12 and 17 players. We ran the two-ship scripted mission four times during the Con, which involved one of the two ships (their choice) having to dock at a station and send off an Away Team which involved playing Keep Talking and Nobody Explodes to disarm a bomb on the station, with the captain choosing who to send. The hotel represented the station, so the away team could only leave/come back into the room when the ship was docked. In the busiest occurrence, we actually had 23 people playing the mission at once. One crew sent 6 people on an away team (from the carrier which had 11 people), and then promoted 6 "DamCon team members" (people watching) into a field commission as replacement crew while the ship left the station to fight enemies. So 6 on Away Team, 6 on the battleship, and 11 on the carrier = 23 people. We gave the Away Team "red shirt" buttons that Sandman showed a pic of above to everyone who went on an Away Team, and let them keep the buttons. Everyone I talked to reported they liked the scripted mission. We also had a number of other special/themed events (see the Artemis page on the con site for the schedule we put up), which I think was helpful, and allowed crews to optionally reserve a bridge ahead of time (3 crews did so, the rest was first come first served). So we had some blocks specifically reserved for Fighters (we hoped to not run fighters all the time, but turned out to be busy enough that we needed to run Fighters a lot more than we expected), Pirates, PvP, the scripted mission, and even a "Space Camp" session for ages 8+. Advertising the times of the scripted mission ahead of time was effective in having people arrange their schedules specifically so that they could participate in the scripted mission. One person even said that Artemis was the reason they came to the Con in the first place. This was also our first year of having a dedicated room the whole time, which we could lock up overnight. This allowed us to run more hours (between 4 GMs) and still not feel burnt out. We got assurances from the Con committee that they'll give us our own room next year too. It was also nice that this room had its own temperature control so we could crank up the air conditioning with all the computers and people so it was quite pleasant the whole time, its own lighting controls so we could dim the lights, and opaque curtains so we could block the windows the whole time. Since we could leave things up for 3 days straight we brought more equipment and photo backdrops that can be seen in Sandman's videos. We also had one screen with a rotating slide show that showed our schedule of events, some of Thom's Artemis posters meant for Cons, and LawsonThompson's excellent "Fly a Starship" posters. We wanted to put the screen in the hallway outside the room but couldn't get hotel permission to do that so had it inside the room, where it can be seen on the left in Sandman's "resupply" video clip posted in this thread. As Sandman said, we ran 2.7.1 the entire time and it was quite stable. We did have a number of crashes on the main screen of the 2nd ship. The server and the main screen of the 2nd ship were both running Artemis Bridge Tools, but only the main screen of the 2nd ship would crash (probably 6 or 7 times total across the three days) so it's not clear whether there's an issue in Artemis itself or in Bridge Tools. Should also add that the room we had was, I believe, 15' x 29'.